GIVEAWAY!!! Custom Japanese Deco Mirror!!!! Personally made by ME to U !!! Hi Lovlies! I decided to give this very personal and custom giveaway; personally designed and made by Me to YOU! The following pictures are sample of what you will receive if you dont’ have any custom design in mind that you want me to do. If you do have custom design in mind, such using your initials on the mirror. etc, you can negotiate it with me when you win! The mirror inside include regular mirror and magnify mirror. The difference is more obvious in person than the photo presented. Sample of a different style Deco Mirror. Alright? Easy enough? I gave you plenty of opportunities to enter multiple entries!!! Please use them! 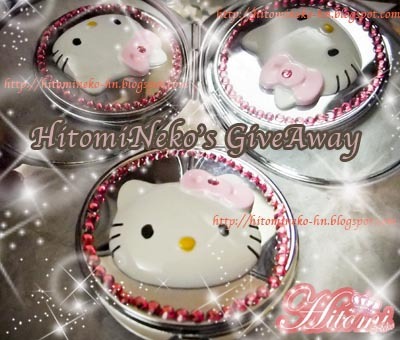 Winner will receive one custom mirror, Deadline : April 9th 2011. Winner will be determined by random. Thanks Sweetie, I will add you as well. I did not know you had a blog on here either. Hey! Thanks to comment my blog!! 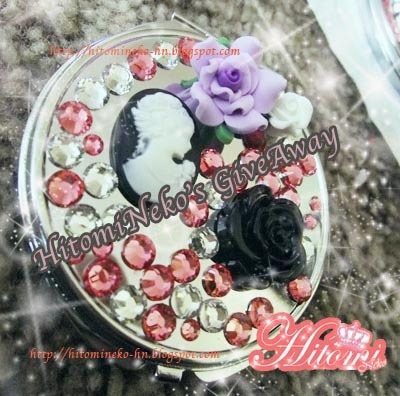 I want to Entry to this giveaway! Your mirrors are wonderfuls!!!
" frameborder="0" height="851" marginheight="0" marginwidth="0" src="https://spreadsheets.google.com/embeddedform?formkey=dFV1cV9PZ1JpY2NiNTJxYjJRTlRYMlE6MQ" width="760">&lt;p&gt;&lt;p&gt;&lt;p&gt;&lt;p&gt;Loading...&lt;/p&gt;&lt;/p&gt;&lt;/p&gt;&lt;/p&gt;"
Hi! Thanks for following and commenting in my blog! This mirror is soo amazing!! I entered the giveaway ;-) see ya! it says to type "enter me"
so... ENTER ME! (in the contest) lol. i really like the hello kitty one! thanks for the cute giveaway!!!! thanks for these amazing mirrors!! lol i forgot this: enter me please! I'm a follower! :-) and I love this, this is soo cute!